Mountain View, Calif. (January 16, 2019) – British Columbia’s importance to famed Italian motorcycle maker Ducati will be reflected this week as the Bologna-based brand brings their new lineup to the 2019 Vancouver Motorcycle Show. The display at the TRADEX Exhibition Centre in Abbotsford will be the backdrop to Ducati’s most diverse lineup yet, available for the public to experience from Friday, January 18 through Sunday, January 20. As British Columbia is a important market for Ducati, the representation of the brand is stronger than ever being able to confidently service the motorcycle enthusiasts of lower mainland British Columbia. These include the anticipated relocation and exclusive Ducati flagship, Ducati Richmond, which is scheduled to relaunch April 1, Ducati’s newest location, High Road Langley in Langley, Vancouver BMW / Ducati, Island Ducati in the heart of Victoria on Vancouver Island and, Bentley Motorrad in the Kelowna. With the exhilarating new 2019 motorcycle offerings, Ducati has a wide breadth of new motorcycles appealing to those seeking exhilaration from the sport. Adventure riders will have the opportunity to explore the all-terrain capable Multistrada 1260 Enduro, while Ducatisti can also check out the first completely new Diavel since its debut in 2010, with a new 1262 cc engine and muscular styling. The Hypermotard 950 also gets a big update with a new look, lighter weight, improved technology and higher horsepower engine. Motorcycles representing each of the Ducati Worlds, ranging from Racetrack, Travel, Lifestyle and Scrambler to Sport & Fun, will be featured. In addition to the exciting new models, Ducati will also have an a selection of the 2019 Ducati Apparel collection and Ducati Performance accessory selection on-site to complement these different worlds of motorcycling. For those clients interested in securing a new 2019 Ducati, orders will be taken on-site at the TRADEX Centre with deliveries starting as early as February 2019. Diavel 1260 ($22,995 CAD MSRP / Available April 2019) – Unconventional, unique and unmistakable, the second-generation Diavel 1260 remains faithful to the original spirit of this incredibly special bike, drawing on its key styling elements and putting a decidedly more contemporary slant on it. Its Testastretta DVT 1262 engine is capable of delivering 159 horsepower at 9,500 rpm. The bike also includes an upgraded chassis to make it more responsive on mixed-road routes. The S version on display also features fully adjustable Öhlins suspension, dedicated wheels, and an even higher-performance braking system, with Ducati Quick Shift up & down Evo (DQS) as standard to allow clutchless shifting. Panigale V4 R ($47,995 CAD MSRP / Available March 2019) – The new Ducati flagship superbike, the Panigale V4 R, will be making its debut for British Columbia in Vancouver. The motorcycle features technology taken from MotoGP racing and is a racing bike that can be enjoyed on the streets. Following Ducati’s first mass-production four-cylinder engine, the V4, debut in 2017, the V4 R is now the pinnacle of the new Panigale V4 family and can claim the title as the ultimate road-legal Ducati competition bike. This is the most powerful, high-performance factory bike ever built by Ducati, with new technology like carbon fiber aerofoils that increase stability and allow for reduced reliance on electronic controls. Multistrada 1260 Enduro ($27,195 CAD MSRP / Available March 2019) – The Multistrada 1260 Enduro is the new generation of the off-road member of the Multistrada family. It has an increased engine size with the 1262 cc Testastretta DVT engine pushing out 158 horsepower, which is an increase from 152 horsepower from the previous Multistrada 1200 Enduro. Hypermotard 950 ($15,295 CAD MSRP / Available February 2019) – With new sharper angles and a lighter weight, the adrenaline-packed Hypermotard takes its look from the supermotard race world and for 2019 comes with completely overhauled ergonomics and an ultra-advanced chassis set-up and electronics package. A full 8 lbs lighter than the previous model, the Hypermotard mounts a renewed 937 cc Testastretta 11° engine with a more muscular 114 hp. Hypermotard 950 SP ($18,795 CAD MSRP / Available February 2019) – The spirited and higher-performing Hypermotard SP also on display is Ducati’s offer for those looking for Hooligan-style excitement, featuring a flat seat, increased-travel Öhlins suspension, Marchesini forged wheels and Ducati Quick Shift (DQS) Up and Down EVO, as well as Carbon Fiber components such as front mud guard and timing belt covers. 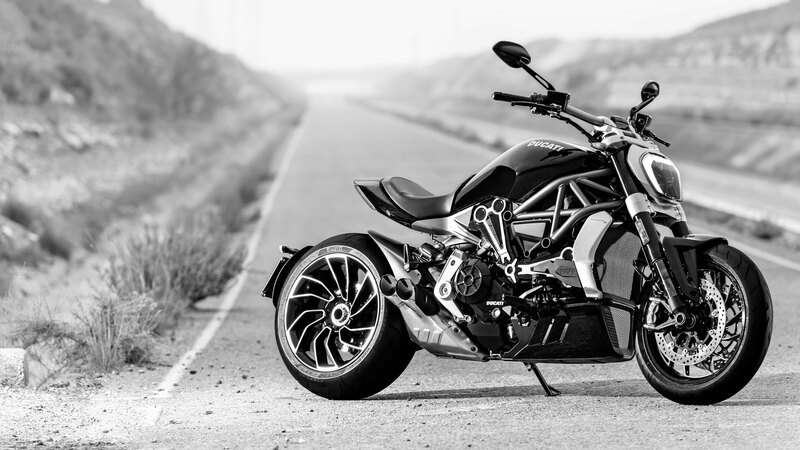 XDiavel (Matte Liquid Concrete Grey) ($23,395 CAD MSRP / Available Now) – New for 2019, the XDiavel – famous for representing the best parts of the Ducati performance world and the relaxed cruiser world – now comes available in an uncompromising new color palette, the stunning Matte Liquid Concrete Grey. The finish and style express the motorcycle’s edgy spirit and take the XDiavel’s strong look to new levels. Scrambler Icon ($10,795 CAD MSRP / Available February 2019) – The Scrambler brand was launched in 2014 and has become Ducati’s best-selling model by volume. For 2019, the new Scrambler Icon continues this vintage-inspired-joy of a motorcycle with important technological updates in the world of safety, including Bosch Cornering ABS. Visually, the new motorcycle continues retro-inspired style with new, beefier side panels to match the steel of the teardrop tank and the glass of the headlight. A black-painted engine, brushed cylinder head fins and machine-finished rims give the new Ducati Scrambler Icon even more eye-catching panache. Scrambler Desert Sled ($13,495 CAD MSRP / Available February 2019) – For 2019, the Scrambler Desert Sled rekindles the spirit of classic American off-road bikes without compromising the Ducati Scrambler lifestyle. With its red frame, new seat with color-coordinated stitching and spoked wheels with black rims, it exudes off-road fun. The new Desert Sled also features an Off-Road Riding Mode that allows ABS disengagement for down-in-the-dirt joy. A dedicated riding position and adjustable Kayaba suspension also ramp up the fun factor. Rugged off-road character oozes from the type-approved headlight mesh guard, high mudguards (specially designed for this version) and engine skid pan. Scrambler Café Racer ($13,295 CAD MSRP / Available February 2019) – The new 2019 Scrambler Café Racer draws its inspiration, and its Silver Ice Matte graphics with blue frame, from the legendary Ducati 125GP Desmo. The new 17″ spoked wheels and aluminum bar-end mirrors give the bike a cool 1960s race look, while a modern radial front brake pump provides braking performance on a par with that of a sport bike. It’s a rare Ducati in blue – one surely to catch the eyes of everyone on the streets. Scrambler Full Throttle ($12,395 CAD MSRP / Available February 2019) – The new 2019 Full Throttle takes its cue from the flat track Scrambler ridden by Californian racer Frankie Garcia in the 2018 American Super Hooligan Championship. With its two-tone black-yellow, white-striped tank, all-new rear end with dedicated seat and white-rimmed yellow number holders, this bike has a real dirt track competition feel. A low-slung tapered handlebar – light and ergonomic – stubby front mudguard and dual-silencer exhaust add to the distinctiveness of the Scrambler Full Throttle.